Thanks to our continued success, LGFL now have taken a private office in Spaces, Reading for our Directors. It’s a perfect match for our aim to provide the best service for our divorce and family law clients, being very close to the court, Reading train station and a large central NCP car park, as well as two hour street parking available just outside. It’s important to arrive in good time at court, but inevitably an early arrival involves waiting in the court building corridors, which are not the most inspiring or comfortable places to sit. Clients often find waiting in the court building actually makes them more nervous, and the lack of privacy can be an issue too. 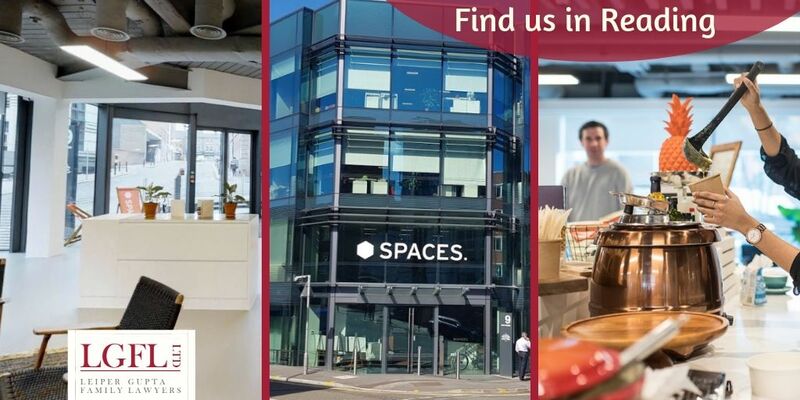 Instead, if you are attending court with either one of our Directors, you can meet us and your barrister at Spaces. Our new office is a modern, relaxing space with excellent facilities, and has access to great coffee and refreshments. It’s then just a five minute walk to the court building to clear the mind, so we all arrive ready and positive for the proceeding. Once a hearing is done, you can be back at your car, central Reading office, or on a fast train to London within minutes. In turn, we can be back at our desk, coffee in hand, ready to help other clients with their family law and divorce cases! Our new office at Spaces is also an ideal setting for our free 30 minute consultations. If you work in Reading, you can pop across at a time to suit your during your working day, including lunchtimes or after work. If you live outside the city, you can drive in and park within a three minute walk, or come on the train to the central station for a traffic-free journey. Since Spaces is a shared business hub, nobody will know who you have come to visit, and once in our office, our conversation will always be completely confidential. We’ll also soon be able to scan important documents and proof of identity in the office, saving time and effort for all. This is all part of our holistic approach to Divorce and providing our clients with what matters. We recognise that your time is precious, and we listen with empathy. We look forward to meeting you and helping start to resolve your family law issues over a brew and a biscuit or two.